The fight between Labour and UKIP is heading to Wales. Nigel Farage's party is challenging in seats where Labour traditionally dominate at the general election, and it could be on course for electoral success there within the year. Voters in Caerphilly have always elected Labour MPs. But on 7 May this was one of 120 constituencies where UKIP came second, and soon there will be another election here on terms likely to suit Nigel Farage's party. Professor Roger Scully, of Cardiff University, tells BBC Radio 4's the World at One that at the moment UKIP are on course to win six or seven seats in the Welsh Assembly next year. The campaign here will be one of the first jobs on the to-do list of a new Labour leader, and will pose a fundamental question: what should Labour do about the threat from UKIP? The voting system for the Assembly election next year combines first-past-the-post contests and proportional representation, giving smaller parties like UKIP a much better chance than in Westminster contests. Sam Gould was UKIP's candidate in Caerphilly at the general election, winning almost a fifth of the vote, its most improved result in Wales. A former Labour voter, he has only joined UKIP in the last year. A few months ago the party had no presence in the town. Image caption Will Nigel Farage be celebrating big gains in Wales? Showing me around the Lansbury Park estate there, he says: "We've only been organised as a party for a matter of three months and so for us to get to 20% of the vote after only organising ourselves and running a three month campaign is tremendous. So what can we do in a year?" There has never been a rush to vote Tory in much of south east Wales. The legacy of mines long since closed still marks the landscape, politics and cultural identity of the area. But Professor Scully says that doesn't guarantee an unchanging allegiance to the Labour party. 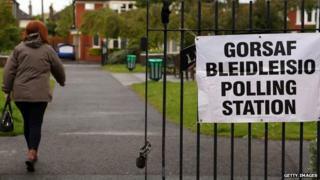 He says: "There was an element of the Labour vote in the South Wales valleys, an element of sort of socially conservative working class voters in much of Wales, that was unenthusiastic Labour and that was ready and waiting you might say for UKIP to come along and try to attract them." You might think that a deeply worrying analysis for the Welsh First Minister Carwyn Jones. Yet he appears far from panicked, instead suggesting other parties will suffer at UKIP's hands. He says: "All the opinion polls seem to suggest that the seats would come from other parties not from us, bearing in mind we have 30 out of the 60 seats and 28 of them are first past the post. "In terms of losing seats in the proportional representation section, actually it's other parties that would lose the seats other than ourselves." Labour's near-wipe-out in Scotland is recent, raw and devastating. It seemed unthinkable, until it happened. Wales' politics are very different; neither UKIP nor the Welsh nationalists Plaid Cymru have enjoyed an SNP-like surge. But after its Scottish trauma Labour must wonder whether the party in Wales - and its leader - accused by opponents of taking traditional support for granted and facing fresh threats, could suffer a similar fate. The Welsh First Minister says the possibility is "always there in the forefront of our minds". But he adds: "We wanted to make sure that people saw us as a party that would stand up for Wales, a party that was devolutionist in its outlook while at the same time not a party that supported independence and that was the basis for our success in 2011. "In Scotland I get the impression that Scottish Labour went the other way and left that contested ground to the SNP. It's not a mistake that we're going to make." He suggests Labour's leaders in Scotland made errors that he has already managed to avoid. His analysis will be tested by voters in Wales next May. With Scottish and London Mayoral and Assembly elections due on the same day, it could be a moment to help demonstrate whether Labour has learned how to win back voters, or whether it has been abandoned by some of its traditional supporters for good.